If you have any questions about the LADY HARMONY information page below please contact us. This well proportioned luxury yacht LADY HARMONY is a motor yacht. This 33 m (110 ft) luxury yacht was created by Overmarine (Rodriguez Group) in 2001. She could be described as a recent sports style yacht. LADY HARMONY was formerly called Stanley. Superyacht LADY HARMONY is a majestic yacht that can sleep as many as 8 people on board and has approximately 3 qualified crew. 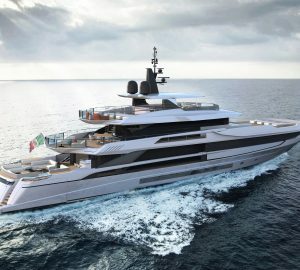 The yacht's general design work came from Studio Bacigalupo and Stefano Righini. The formal naval architect firm plans are the work of Studio Bacigalupo. In 2001 she was formally launched to triumph in Massarosa and following sea trials and detailing was thereafter handed over to the yacht owner. Overmarine (Rodriguez Group) completed their new build motor yacht in Italy. The core hull was constructed with composite. The motor yacht superstructure component is made extensively with composite. With a width of 7.1 m or 23.3 ft LADY HARMONY has reasonable internal space. A fairly shallow draught of 1.74m (5.7ft) affects the number of worldwide marinas she can berth in, contingent on their specific characteristics. The motor yacht makes use of twin powerful MTU diesel engine(s) and can reach a exciting top continuous speed at 37 knots. The engine of the ship produces 2780 horse power (or 2046 kilowatts). Her total HP is 5560 HP and her total Kilowatts are 4091. She is driven by twin water jets (kamewa). LADY HARMONY has a/an magnificent cruising speed is 32 knots which makes a range of 400. The well proportioned luxury yacht M/Y LADY HARMONY is able to sleep up to 8 guests in addition to 3 qualified crew. Approximate Cruise Speed is 32 nautical miles per hour. Her top Speed is around 37 nautical miles per hour. The luxury yacht LADY HARMONY displayed on this page is merely informational and she is not necessarily available for yacht charter or for sale, nor is she represented or marketed in anyway by CharterWorld. This web page and the superyacht information contained herein is not contractual. All yacht specifications and informations are displayed in good faith but CharterWorld does not warrant or assume any legal liability or responsibility for the current accuracy, completeness, validity, or usefulness of any superyacht information and/or images displayed. All boat information is subject to change without prior notice and may not be current.